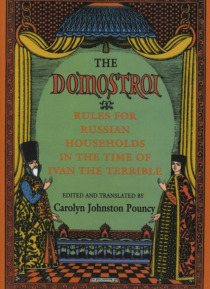 A manual on household management, the Domostroi is one of the few sources on the social history and secular life of Russia in the time of Ivan the Terrible. It depicts a society that prized religious orthodoxy, reliance on tradition, and absolute subordination of the individual to the family and the state. Specific instructions tell how to arrange hay, visit monasteries, distill vodka, treat serva… nts, entertain clergy, cut out robes, and carry out many other daily activities. Carolyn Johnston Pouncy here offers, with an informative introduction, the first complete English translation.